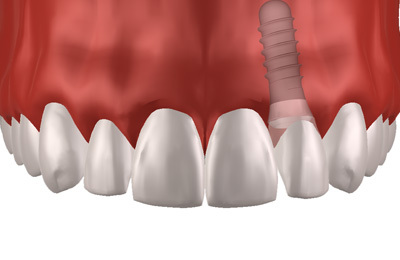 The implant occupies the role of the tooth root transporting chewing pressur to jaw bone. So the bone is kept in use and stays vital, preventing bone decomposure. A new tooth is not only to fulfil its duties, but, especially in the front sector - to fit in smoothly with the others. An aesthetically pleasant result is the most important thing. Well-fitted, implant-supported teeth do not only look like your own, they feel like it, too. Implant, new tooth and soft tissue are to form a harmonious unity. In case of multiple tooth loss the transfer of chewing pressure to the jaw bone is no longer equilibrated. This may culminate even bone decomposure. A gap should be closed, be it for aesthetic or medical reasons. Implants grant a full restorement of the natural chewing procedure and prevent bone decomposure. How many implants have to be used on one single patient depends on his/her bone quality, the number of missing tooth and the solution chosen. Even in case of complete tooth loss implants can provide an aesthetic and firm solution. In terms of wearing comfort and quality of life an implant-supported, removable prosthesis is the therapy of first choice. There are two options for patient suffering from edentulous jaws: a firm denture screwed into place on implants or an implant-supported and removable prosthesis. Removable, implant-supported prostheses do not shift and prevent pressure marks. They stick firmly to their pillars, the implants. Entirely fitted dentures are the aesthetically more sophisticated option. Highest wearing comfort and more natural looks are characteristic for this solution. Both solutions prevent the patient from usual denture-related problems such as pressure marks, slipping or pain during meals.